Teaching is a very rewarding profession, and teaching people to care for others even more so. 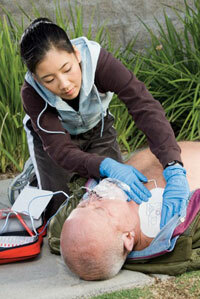 Whether you are a diver or not, teaching First Aid courses is rewarding both professionally, and financially. Since Emergency First Response Instructors and First Aid at Work (FAW) Emergency First Response Instructors do not need to be involved in the dive profession at all, it is a vocation that is open to nearly everyone. Because of legislation in Australia requiring many people to have Workplace First Aid certificates, the market is enormous. Teaching Oxygen Administration is a career path open only to current PADI Instructors or Trainers. Since Oxygen Administration is required by many agencies and departments in Australia, it can be a very lucrative path as the number of O2 Instructors is much smaller than the number of First Aid Instructors who can meet that demand. Courses taught by Go Pro Townsville are all Nationally Recognized courses. The Emergency First Response First Aid at Work (HLTFA311A ) course is equivalent to Senior First Aid courses offered by other providers such as the Red Cross and St. John's Ambulance. In addition to standard FIrst Aid and CPR courses, we also offer the Nationally Recognized PADI Administer Emergency Oxygen provider course. Candidates undertaking PADI Instructor training are now required to be Emergency First Response Instructors before certification. Other interested divers and non-divers alike may take EFR Instructor course provided they are 18 years of age, or older, and have a current (past 24 months) first aid and CPR rating. Those wishing to use their new teaching credentials to issue Nationally Recognized statements of attainment must also complete the Emergency First Response First Aid at Work Instructor course, hold a Certificate IV in Training and Assesment, and register with PADI's RTO. Instructors wishing to teach the Nationally Recognized 22100VIC - Course in Basic Oxygen Administration course must complete PADI's Administer Emergency Oxygen Instructor course. All of these courses are offered by Go Pro Townsville and descriptions and prices for all Professional Level courses can be found here.